Mauro Icardi is willing to hand Inter team-mate Kwadwo Asamoah his captain’s armband following Serie A’s racism storm. Senegalese defender Kalidou Koulibaly was targeted with vile monkey noises during Napoli’s 1-0 defeat to the Nerazzuri on Boxing Day. Inter have been ordered to play two matches behind closed doors after the incident, with their ultras banned from one further fixture. And Wanda Nara, wife and agent of Icardi, has suggested the Inter skipper could also hand over the club captaincy for one of those games to Ghanaian left-back Asamoah as a show of support. The glamour model also called on Serie A to hunt down the fans who made sick taunts. She said: “Mauro would be happy to give the captain’s armband to Asamoah. Napoli boss Carlo Ancelotti repeatedly asked the referee to suspend the game as the abuse continued. Incensed Koulibaly, 27, was then sent off late on for two quickfire yellow cards, the second for sarcastically applauding the official. Icardi appeared to console Koulibaly – who signed a new Napoli deal last week despite interest from Manchester United – as he walked off the pitch after seeing red. And Nara revealed the incident has left a ‘bitter taste’ for Argentina international, despite Lautaro Martinez’s injury-time winner. Speaking on Italian TV, she added: “When Mauro came back from training today I asked him what he said and he was still a bit in shock and that they could not enjoy the victory. “Obviously, there is a bitter taste for everyone and he too is also affected. “He tried to reassure Koulibaly despite rushing him off the pitch, Mauro wanted to make him understand that he was risking to be banned for more than one match. 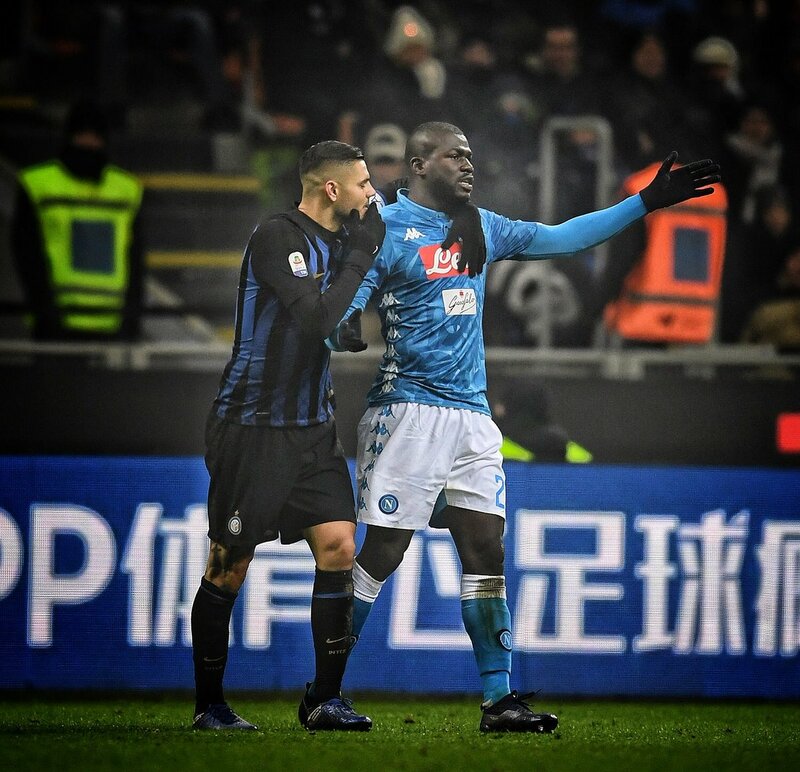 Koulibaly, who has been also banned for two games for his red card, hit back at his abusers in an Instagram post on Thursday. He wrote: “I am sorry about the loss and above all to have left my brothers [out on the pitch].